And as naturally polished as lapis lazuli. Pervade and encompass the vastness of space. You who rescue all who are destitute. Of Avalokiteshvara: protector of the three worlds. And who are able to draw all the beings to you. And the offering of the twenty-one homages. recite the twenty-one homages three times. Epidemics, poisons and all various sufferings. Please grant your blessings through your great compassion. May all share in its good effects. So that we may attain full and perfect enlightenment. Be fulfilled naturally and effortlessly, without exception. Mind of enlightenment increase like the moon waxing full. O Mother holding an utpala flower, may you be auspicious ! Throughout the worlds and directions where I and all others dwell. please bring your auspicious presence to us! His three secrets unperishing, undeclining, unchanging. Be spontaneously accomplished according to his wishes. Bringing an eternal spring of renewal to every living being. Until it reaches the summit of samsara and nirvana. Unfolding our minds and strengthening our hearts and those of others. And may we sail the sea of supreme conduct of the One Who is Consummate Goodness. May all our prayers instantly be fulfilled with effortless ease. Mahakala, you wear a tiger-skin loincloth. On your crown, Aksobhyas royal presence is fixed. You wear a great necklace of fifty mens heads, dripping blood. On your crown, youre adorned with five dry, jewelled skulls. CHI-DÖ NGÖ-DRUB NYUR-DU TSÄL-DU SÖL! made infinite offerings to the Buddhas pervading every atom of the universe. 2. Potala – a mountain in South India and the home of Avalokiteshvara (Chenrezig). 3. Lower realms – hells, hungry ghosts and animals. 4. Ten directions – four cardinal directions, four intermediate points, up and down. mother, Arhat, shedding the blood of a Buddha, causing a schism in the Sangha. paths of insight, cultivation and no-more learning. 8. Sukhavati – the Blissful Pure Land Sukhavati in the West. marks – 80, such as copper-coloured, glossy and prominent nails. of desire, form and formlessness who arise as an I based upon samsaric aggregates. face embodies the delicacy of a million lotus blossoms. of the primordial Dharmakaya Buddha Amitabha. 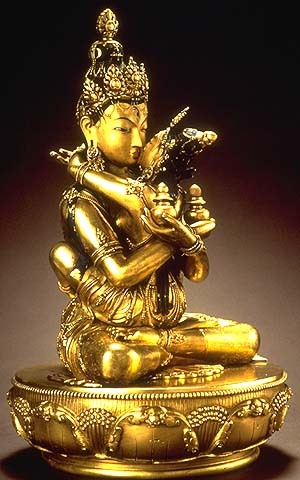 Tara, for example, embodies the fertile, motherly aspect of compassion. 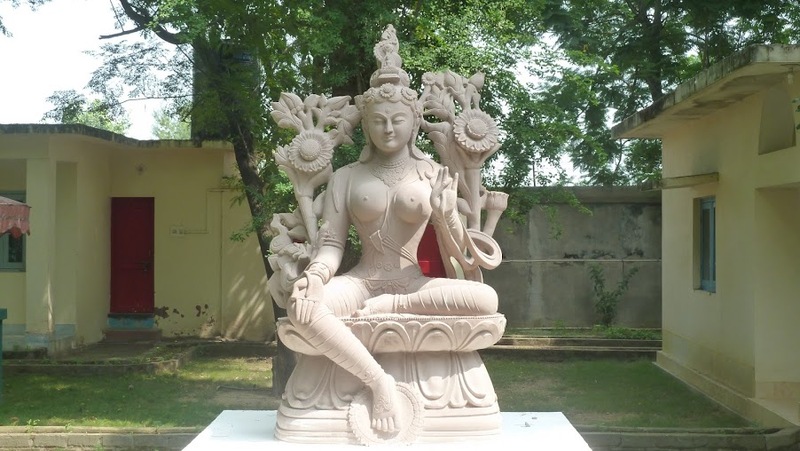 The verses in praise of the symbolic attributes of Taras being has two parts. symbolises how Tara embodies the Ten Perfections. rely upon Tara for she embodies the utter fulfilment of the Ten. realms of man and the desire gods and the realms of the gods of form and formlessness. symbolise this she sits in the centre of a raging fire. destroys both of these obscurations together with their seeds. her remaining three left fingers are stretched upward into the mudra of the Three Jewels. radiates forth waves of light to outshine the lights of samsara. spontaneously respond to the goodness generated by meditation upon Tara. giving total liberation from all forms of sorrow such as poverty and pain. a constant stream of light to fulfil the needs of living beings. of delusions, the foes of the Trainees joyously following a spiritual path. This verse is in praise of the mind and speech factors of Taras Dharmakaya aspect. and clinging to substantial existence in the external world. cause everything in the external world to tremble and shake. of the gods and celestial beings bow their heads to Tara. delusions within as well as external poisons. 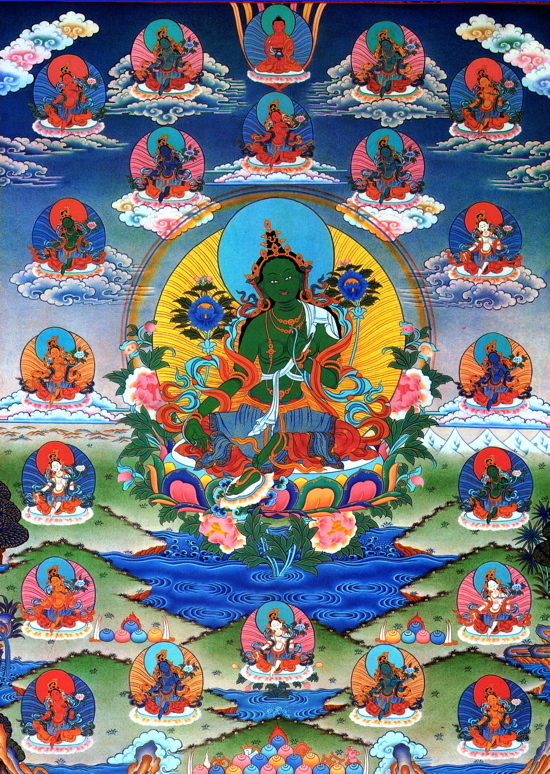 The most exalted TURE refers to TARA herself. 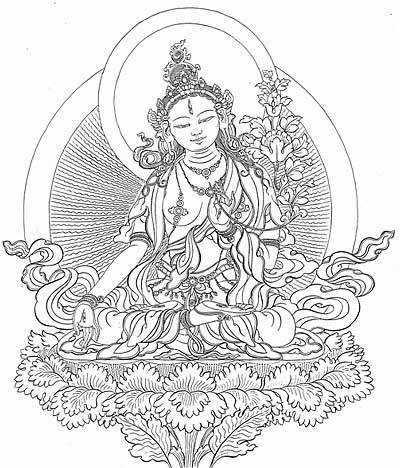 sky above her on rainbows and lotuses, while her other main form, White Tara, is found below. wealth, to the Object of Refuge as an act of veneration. 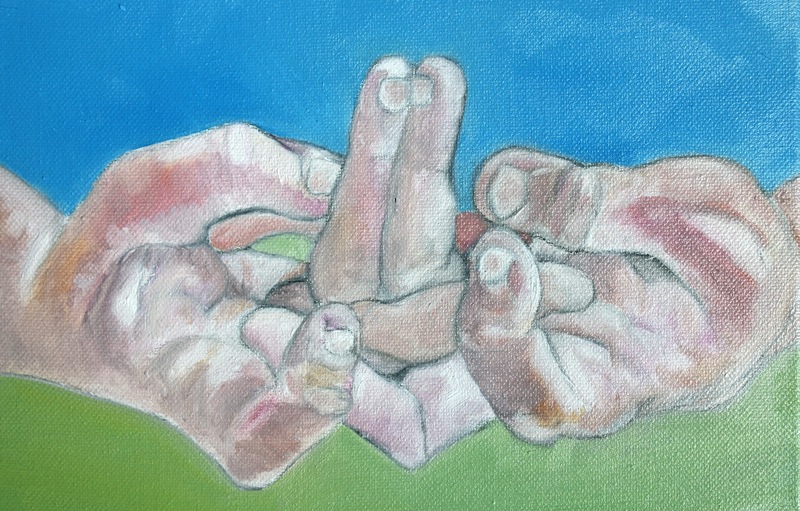 fingers raised upwards in the centre represent Mount Meru. you should imagine that all the wealth contained in the entire world is present in your hands. the Mandala as happily accepting it, you should proceed to unfold your hands away from you. of Refuge to whom the offering is made, then you should unfold your hands towards you. Namgyal Trinley and by the Junior Tutor to His Holiness, Trijang Lobsang Yeshey Gyatso. government officials along with the people and gods of the land of Tibet. wishing that its aims may be fulfilled accordingly. the explanation of Ven. 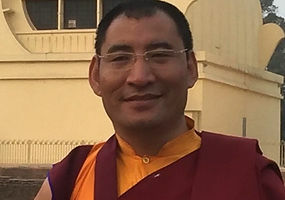 Lobsang Nyima, Abbot of Namgyal Monastery. passing through the ten Bodhisattva levels, he received the special Great Light empowerment. 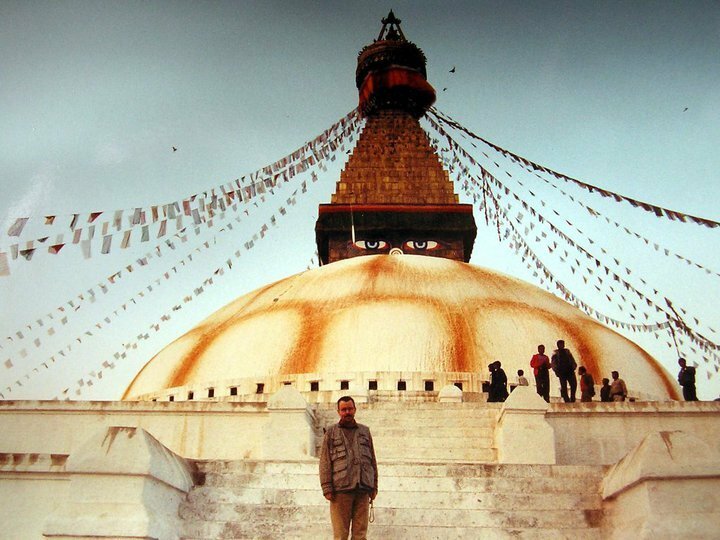 uncountable years – many, many kalpas. Then, at one time, he thought it possible that now he had delivered all beings from samsara. vow could never be exceeded. And yet by it he had been unable to benefit even a few beings. so that their needs could be met by their simply making the wish. Protector of Wisdom. In all the Pure Lands, the ground shook with six kinds of earthquakes. 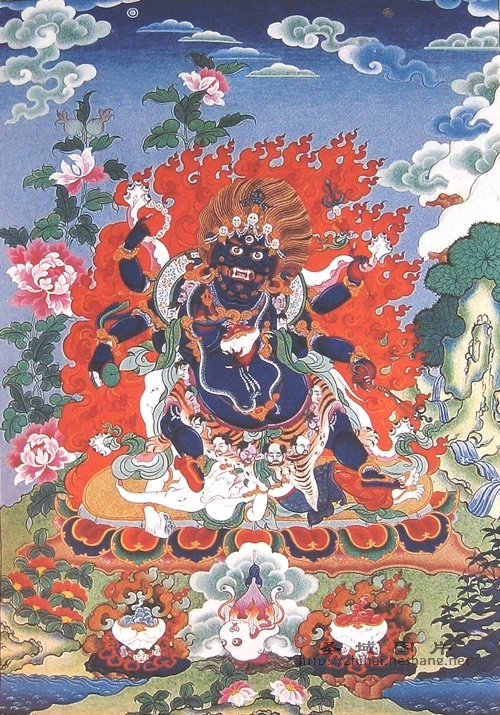 Ever since then, Mahakala has remained as the Doctrine Protector of all the Buddha fields. dakinis. His trident symbolises his power over the three spheres – desire, form and formless. anger. All his other ornaments symbolise that he has the complete qualities of the Buddha. With TUTTARE dispelling all forces!